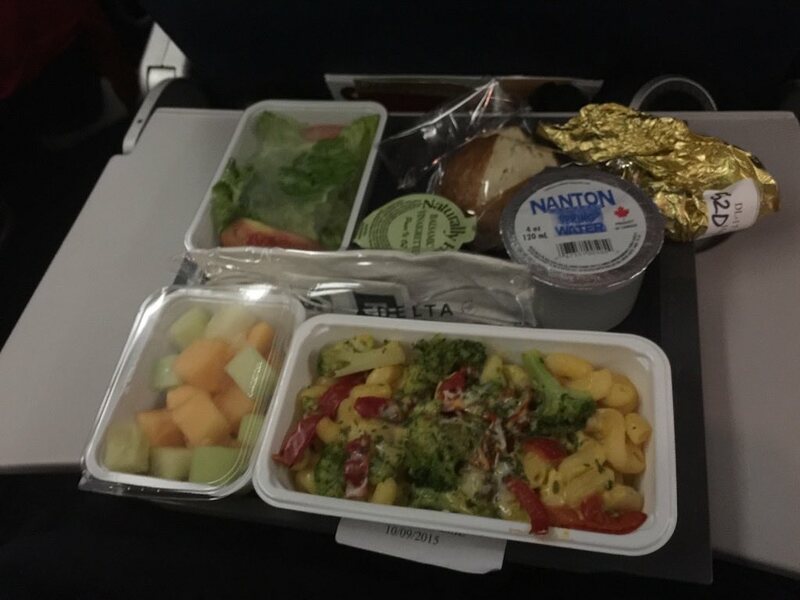 Delta meals from LAX to Sydney – OMG it was worse than awful! You may remember a few weeks back I blogged about the amazing meals on Virgin from Brisbane to LAX. So on our way home, we were on Delta flights from Orlando via LAX to Sydney (Delta is codeshare with Virgin). I’m guessing you are already seeing where this is going, right? On my boarding pass, it clearly stated I had a special meal – guess what wasn’t on the list the crew had. My partner’s meal was listed, the 3 kids meals were listed… but no meal for me. Perhaps they knew exactly how many donuts I had eaten in the US and figured my health kick needed to start immediately? But a 15 hour flight with no meal is not a fun place to be – hangry plus sleep deprived is not a pretty sight – I really would look like my passport photo at the end of it. The crew member I spoke to said “she would see if she could find something”. So first meal service and they hand out the special meals to everyone else, except me. Then they announced the meal choices for the rest of economy and one of the items was a vegetarian ravioli – sounds ok to me. However before the cart got to us, they come to me with a “spare special meal” which a the lacto-ovo meal that someone else declined. This person must have had psychic vision and declined it, as this meal was the exception to the rule about special meals being better quality. It was awful! Soggy, bland pasta. I ate most of it and then wished I’d just waited for the cart and asked if there was a ravioli available. Afterwards my sister-in-law said the ravioli was great… damn it. But wait, how about a nice breakfast? One of the reasons I order an asian inspired vegetarian meal is to avoid the hideousness that is a plain egg omelette (it seems its compulsory for the vegetarian breakfast). Or worse, the crayola crayon flavoured vegetarian sausages… or those awful plastic button mushrooms that must be manufactured at Boeing. But hard to imagine, the breakfast was actually worse than the dinner – a plain egg white omelette with tasteless spinach. For the love of all things holy, does nobody try these meals before serving them? All the taste, life and joy was completely sucked out of them. That does look rather nasty. 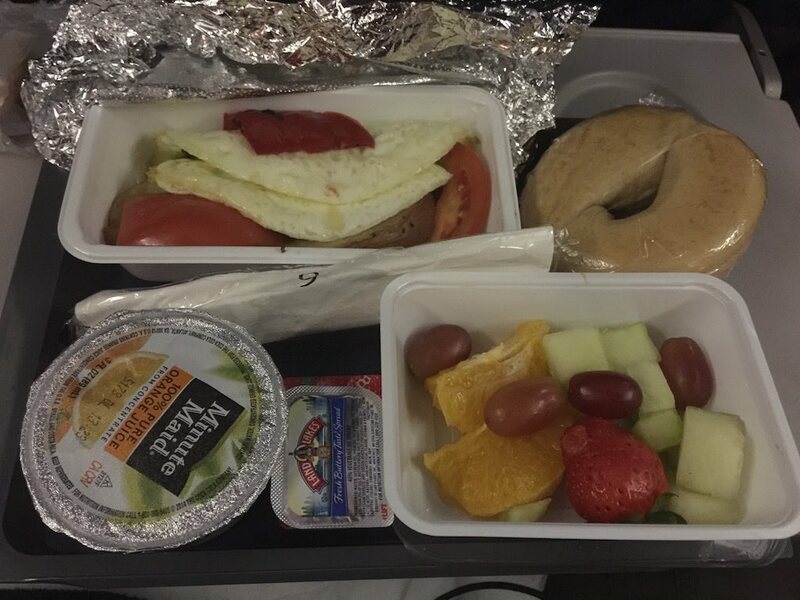 The absence of meals is what I like best about European low cost airlines. Just buy a sandwich and take it on board! If I had known I wasn’t going to get a meal, I would have definitely done that. Luckily I also travel with snacks too. If they hadn’t had anything for me it would have been around 30 hours without food as the flights from Orlando and then again from Sydney to Christchurch also didn’t include meals either and we didn’t have long at the airports between flights to get food. It’s so bad that we pay heavy prices and duties to be fed this gross .. It was so horrible! Yet the meals going over on Virgin were amazing!